A proprietary coupling technology, which models precisely how vibrating objects interact and influence each other, captures key acoustic behaviours of musical instruments resulting in a library of truly expressive instruments in a vast range of sonic colors. There is nothing quite like Chromaphone with its mix of acoustic modeling and synth-like features. Its sonic palette is remarkable and it reproduces the feel and responsiveness of real-life acoustic instrument. With this new version, Chromaphone now benefits from a a full multi-effect module and an arpeggiator which greatly expands its scope but most importantly we have reviewed every module in order to endow Chromaphone with a sharper response and make it even more responsive and expressive. A key feature of Chromaphone is a brand-new coupling technology. The coupling refers to the exchange of acoustic energy which occurs in real life between interacting objects. Consider a string bridged to a wooden soundboard, both have their own behavior and characteristics, but when assembled together, they merge into a complex string instrument. In a similar way, a metal bar interacts with the air column from a tube in a vibraphone. 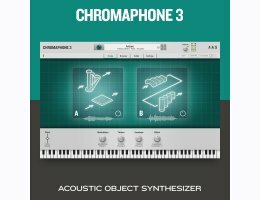 Chromaphone is the first and only plug-in to provide control over the coupling of resonators. The result is vivid instruments with unmatched acoustic precision, sharpness and realism. Super smooth dynamics, no velocity layers! The Chromaphone Demo must be restarted after 20 minutes.